There’s been a lot of talk in the news lately about credit card companies making changes, such as lowering credit lines and cancelling unused cards, that can lower credit scores even for responsible borrowers. In a recent post How to save your credit score I complained that credit scores seem to be such a mystical thing. I almost always hear broad generalities about how to improve your score, but rarely hear specifics. It wasn’t clear to me if this graph covers ALL the factors in calculating a credit score, but it probably represents the most important factors. One clarification CNNMoney makes is that you should keep your debt utilization ratio under 10% if possible. It should never go higher than 20%. I encourage you to read the whole article, but here is a summary of the most important factors in how your credit score is calculated and what you should do to keep your score healthy. Don’t make late payments (specifically over 30 days late). Keep your debt utilization ratio at ideally under 10% and certainly no more than 20%. This applies to any given credit account as well as looking at your debt for all accounts. Try to occaisionally use older credit cards so they don’t close the account on you. Older credit carries a greater positive weight in calculating your score. Opening new credit accounts tends to lower your score. Still no specifics on how much it lowers your score. The type of credit account you open has an affect on your score. While the CNNMoney article didn’t mention specifics, we know from my previous post that you should try to avoid opening accounts for retail and gas credit cards. The article also listed a couple of resources that I haven’t had a chance to thoroughly check out, but that look useful. Real Simple recently published an article entitled “8 Surprising Ways to Save Your Credit Score.” Despite my best efforts to understand how credit scores are calculated, I still seem to hear conflicting information all the time. This article helped to provide me some clarity. The most interesting point for me was the fact that many credit card issuers are closing accounts that haven’t had any activity for a while. If these accounts get closed, the article points out, it could have a negative impact on your credit score. That’s because it would cause your utilization ratio, the amount of debt you have incurred compared to the open credit available to you, to go down which could cause your credit score to decrease. It would cause a similar affect to a credit card issuer decreasing your credit limit, which apparently happened to several million credit card holders fairly recently and which I wrote about just last week (see Credit Card Companies Adjust Limits: Credit Ratings May Be Affected. Frankly, I’ve tried to shut down some old credit card accounts before, yet they keep showing up on my credit reports. I’d be happy if they shut them down. A couple of the points in this article didn’t explain at all how they affect your credit score. For example point #2 talks about paying off your lowest balance credit cards first. While this is a solid debt re-payment strategy, how does it affect your credit score? Point #3 says that sometimes it can be worth it to use a credit card with an annual fee. Ok, and how does that affect your credit score? Here’s one of the seemingly conflicting pieces of advice. You want to have many open credit card accounts to increase the amount of unused credit available to you, yet opening up a retail or gas credit account actually counts against you when calculating a credit score. So I guess you don’t just want any credit lines. Having available, unused credit has a generally positive impact on your credit score, unless the credit comes from retail or gas cards. Using your credit cards occasionally will help keep your accounts from closing and maintain a high utilization ratio, which is a good thing for your credit score. Consolidating multiple cards to one card can be risky if you come close to maxing out the card. 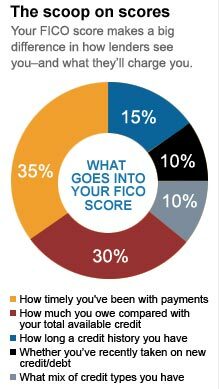 Apparently that doesn’t look so good to the credit reporting agencies although the article doesn’t mention how close to the max is too close. The length of time you’ve had a credit card account can help to increase your credit score. The longer the better. So I guess I shouldn’t want to close those old unused accounts after all. Try not to max out your limits on one card. Instead, it’s better to charge a little on multiple cards. Apparently the credit bureaus calculate your utilization ratio on each individual card. This is a squishy one and there are no recommended limits to stay within. A new study by Fair Isaac, the company that created the FICO score, shows that the credit ratings of 24 million borrowers decreased on an average of 20 points after credit card issuers lowered ratings late last year. The frustrating things about this study is that the rating decrease wasn’t due to late payments or any misbehavior on the part of the borrower. Instead, the ratings changes because the utilization ratio increased for the borrowers whose rates were decreased. The utilization ratio is simply a measure of how much money has been borrowed compared to available lines of credit. In general, the higher this ratio, or the more people borrow compared to how much they could borrow, the lower your rating. If you’re looking to borrow for a home or car, you may want to check your current score by checking the credit reports that you can get for free. A 20 point drop is enough that you may not qualify for the same rates as you could before. Read more about this study at USA Today. Download your free credit reports here.